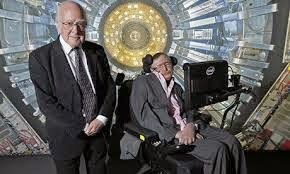 Professor Stephen Hawking, a renown theorethical physicist has warned that the "God Particle" or more properly called, "Higgs Boson" can destroy our universe. The "Higgs Boson" which was discovered last year by CERN is the fundamental particle that gives mass to the universe. Without it, this universe could not exist. In the preface of his new book "Starmus," Hawkings shows his concern that the Higgs Boson may become unstable. According to him, too much energy or 100bn gigaelectronvolts (GeV) will destabilize the Higgs Boson and cause the universe to rapidly decay into a vacuum. Hawking argues that this can happen at anytime and without warning. Humanity would not even notice it happening because it would occur at the speed of light in which light travels at 186,282 miles per second. Naturally, this can occur if man puts his curious finger on the Higgs Boson and "overcharges" it so to speak. The possibility of this event occurring is slim. However, it is indeed possible. This is why there are some in the physics community who believe CERN must be extremely careful when it conducts experiments with particles. Without realizing it, the collider at CERN can create a blackhole which would engulf the Earth and Solar System within minutes. As it stands, we do not have the technology to even make a "run for it" to another star system. We will just be left to our demise. As stated before, the Higgs Boson is extremely important in our universe. This is why the coined term "God Particle" was placed on it. Without this particle, the universe would not be; we would not be. If this particle were to be altered, it would literally destroy the universe. Think of it as a hard drive on a computer. If you alter just one bit of information on the OS registry, your computer will crash and will stop functioning. The same rings true of our universe. If we alter just one particle, it will destabilized the fabric of space and time and the universe will implode on itself within seconds. It would look like when you turn off your television set and you see a quick flash of light decreasing quickly in the middle of the screen. This goes to show how intricate the universe is designed. There is an obvious order to how particles are set up and charged. These charges have to be specific in order for the universe to exist and maintain that existence.